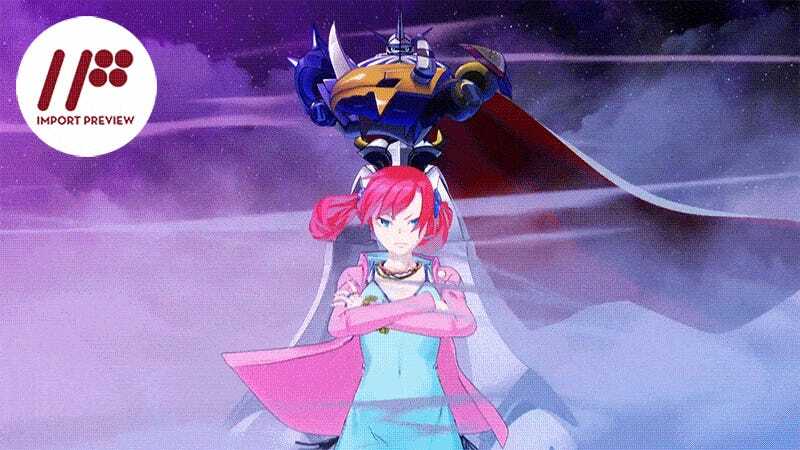 Digimon Story: Cyber Sleuth follows a young teen (in my case, a girl named Ami) and her adventures in both the real world and the virtual reality world of EDEN. One day, she and her two friends, Nokia and Arata, are given the hacker ability to capture and use “Digimon.” However, they are soon attacked by a mysterious creature and, after trying to escape by logging off, Ami finds herself back in the real world—but in a digital version of her body. Her real body, she soon discovers, is in a coma. To figure out what has happened, Ami joins up with Kyoko, a detective who is keen to use Ami’s digital body—and the powers it has—to solve all kinds of cases. After the game’s introductory chapter, Cyber Sleuth enters into a cycle—rotating among taking on cases to help out the three other main characters. Yuuko, the daughter of the former CEO of the company that developed EDEN, hires Kyoko and Ami to investigate her father’s apparent suicide and its connection to the EDEN comma epidemic. Next is Arata who wants to find out the nature of the creature that attacked you as well as its relationship to a mysterious digital ghost. His missions tend to involve incidents where the digital world bleeds into our own, transforming locations across Tokyo. He’s also a hacker...though he is quick to claim he isn’t. Then there are those cases that center around Nokia. At the start of the game, she befriends two Digimon: Agumon and Gabumon. While distrustful of hackers and their programs (i.e., Digimon), she quickly comes to care about the two of them. Her cases involve reuniting her with the pair of Digimon and her subsequent growth as a person through her interactions with them. But what makes Nokia really interesting is how she compares to the player character, Ami. Ami wears the trademark “protagonist” goggles that are a staple of the various Digimon anime and basically mark the lead hero. However, for the first half of the game, it’s not Ami who is the hero, really; it’s Nokia. Not only does Nokia have Agumon and Gabumon—the Digimon of the original anime’s main protagonists—but you also even play as her instead of Ami from time to time at critical points of the story. And while Ami goes around helping out other people, sliding in and out of their stories, Nokia is on a classical hero’s journey. At the start Nokia is an outsider, actively distrustful of the Digimon. But step-by-step she grows from a coward—happy to let Ami fight all her battles for her—to the champion and protector of the Digimon. She leads a guild and stands on the front lines along with her Digimon—for no other reason than it is the right thing to do. She becomes a hero it’s easy to believe in and root for. The other reason Nokia overshadows Ami is that Ami is a nearly silent protagonist. While she will talk to herself in unvoiced text occasionally, the vast majority of her “lines” are a series of dots with some punctuation at the end. And even when she does say something directly to the other characters, all we see is her avatar’s mouth moving while she gestures. Then the other characters simply repeat whatever it is she supposedly said with a “…is what you are saying, right?” tacked onto the end of it. It feels more than a bit silly. In many games with silent protagonists, those characters are supposed to be whatever you choose for them to be—you are their personalities. What’s odd is that Ami has her own personality—and a personal history on top of that. She has her own friends and family that email her regularly. And in cutscenes, while she may not often talk, she constantly reacts visually to what others say. The problem is that without a voice, Ami falls short and doesn’t quite feel like she’s you—but she doesn’t really feel like a distinct, complex character either. Gameplay-wise, you spend most of the game either running around famous locations in Tokyo talking to various people or traversing EDEN’s virtual world and battling Digimon. The battle system is your run-of-the-mill turn-based system seen in JRPGs since the days of the original Nintendo. In general, the battles are easy going and you can use any team you want. However, without fail, the boss battles are brutal spikes in difficulty. Their attacks are far more powerful, their HP is higher, and they use status effects constantly. Often, you will face several bosses in a row with no chance to heal. Some boss battles even require you to solve a puzzle to kick off the boss battle, a puzzle that requires you to have a Digimon in your party that is weak to the boss’ attacks. Speaking of puzzles, the dungeons in Cyber Sleuth are filled with them. Each is based around Ami’s various powers that are part of her digital body. These powers, in turn, are only accessible when she has the correct types of Digimon with her. This is one of the ways the game encourages you to try out different Digimon teams. And let’s be frank: The Digimon themselves are the big selling point in Cyber Sleuth. There are 240 of them included in the game; and there is a complex digi-volving system that will allow you to get any one of them you want—though you may have to evolve and devolve your Digimon several times to get the ones you want. I, for one, spent nearly 10 hours outside the first boss room leveling and digi-volving to get my dream team. The game, however, puts a limit on your team’s total power (with each Digimon being worth a certain amount of points). Of course, each major plot point you accomplish nets you an item that raises this cap a little more. It’s the game’s way of gently nudging you to progress. For old-school Digimon fans like me, Digimon Story: Cyber Sleuth is exactly what I want out of a Digimon game. It has all my favorite Digimon, and lets me have the building blocks to make them right from the start. Moreover, it has a classic Digimon story: a group of kids trying to save the digital world—not to mention our own. The game is challenging, lengthy, and more than a little addictive. And while I personally came out of the game wishing I had been playing as Nokia instead of Ami (due to the latter’s odd lack of voice), that is but a small blemish on an otherwise enjoyable JRPG. Digimon Story: Cyber Sleuth was released in Japan for the PlayStation Vita on March 12, 2015. It will be released in the USA for PlayStation 4 and PlayStation Vita on February 2, 2016.